Legoland theme park is a great family getaway with a focus on young children, but these classic building blocks will make this destination a favorite for anyone young at heart. Plastic Lego building blocks have been a favorite children's toy since 1932, and the various Legoland parks around the world make these small blocks into gigantic attractions. While there are parks in Denmark and the United Kingdom, the Legoland in California is the most famous and the most popular. The California park opened in 1999, and its 128 acres have delighted millions of children ever since. When using these plastic building blocks, there is no limit to the fantasy creations children can imagine. At the same time, the model builders at this unique theme park have no limits when creating fun and exciting attractions based on these popular toys. Royal Joust: Kids can ride their very own life-size Lego horse through an enchanted forest on this gentle ride. Water Works: This fun play area has spouting fountains and other splashy gadgets set to music. Safari Trek: This African-themed ride takes guests up close and personal with realistic Lego models of giraffes, crocodiles, gorillas, and other animals. Fun Town Fire Academy: The whole family can get into the fun with this interactive fire fighting ride. Coastersaurus: This family coaster dips and curves around life-size Lego brick dinosaurs at speeds up to 21 miles per hour. Kid Power Towers: Riders get a great view of Legoland theme park from the top of this colorful free fall ride. The Dragon: This gentle family coaster gives riders a behind-the-scenes look at the park's iconic Enchanted Castle. Dig Those Dinos: This play area is thirty cubic yards of sand where children can practice their paleontology skills by unearthing bones and teeth. Lego Technic Coaster: This wild mouse style coaster offers quick turns and sharp dips to thrill riders of all ages. A Lego-themed park wouldn't be complete without detailed Lego models, and Legoland features dozens of carefully sculpted designs. From the creatures that populate different rides to the decorative accents throughout the park, Lego models are everywhere, but the most spectacular are found in Miniland U.S.A. More than 20 million bricks make up this 1/20 scale area that replicates some of the country's most famous regions, including downtown San Francisco, Florida's Cape Canaveral spaceport, New York City, New Orleans, and the bright Las Vegas Strip. 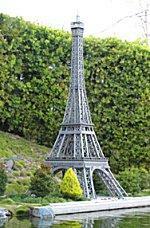 Guests interested in seeing how Legos come together for these amazing designs will enjoy visiting the Model Shop where the professional model designers create new sculptures for the park. Taking the Lego Factory Tour is another great way to learn about Legos by seeing the manufacturing process up close. If the weather is warm, consider putting the kids in their swimsuits or bringing a change of clothing. Legoland has several "wet" attractions including the Pirate Shores water park and the Splash Battle ride. Riders aim water cannons at riders in other ships as well as shore-based pirates and can even be hit by landlubbers! 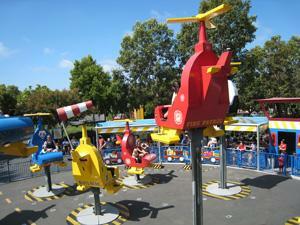 Legoland theme park also offers fun entertainment for children to enjoy. Acts specializing in magic, music, and ventriloquism are all regular features. To cater to children's short attention spans and to leave plenty of time to experience other fun and games at Legoland, the longest shows are only 20 minutes long. Special holiday events are also arranged throughout the year. Guests can take Legoland home with them to build their own models by visiting the park's popular stores. While there are several stores themed to the park's rides, the Big Shop is a purely Lego boutique. With 8,000 square feet of space, the Big Shop has the largest collection of Lego kits and merchandise in the world. Guests who only need a few pieces, however, may prefer the Lego Club House, where different bricks can be bought in bulk. Guests can refresh their energy for further construction adventures by trying a treat at one of Legoland's snack kiosks or restaurants. Favorite treats include sandwiches, wood-fired pizza, hot dogs, burgers, ice cream, popcorn, espresso, salads, and delicious apple fries with a creamy vanilla dipping sauce. It doesn't take an architect to construct a great trip to Legoland theme park. General admission park tickets (2009 prices - subject to change) are $63 for adults and $53 for children and senior citizens. Two day passes are available for guests who can't get enough Lego fun and are priced at $78 for adults and $66 for children and senior citizens. Shopping passes are available for anyone who just wants to finish off their Lego collection - if the shopper returns to the gate within an hour, there is no charge, and if they spend more than $20, their parking fee will be refunded. Many discount tickets for Legoland are available as well - the park is great for birthday parties and groups can buy less expensive tickets. Discounts are also available for AAA members, airline employees, and military personnel.